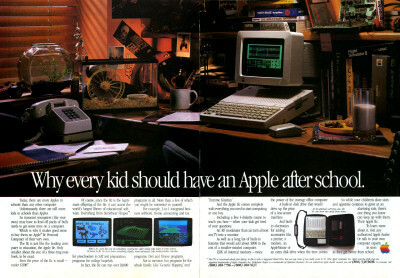 Since I first saw this in a magazine about 12 years ago, this Apple IIc (//c if you prefer) ad has probably been my favorite Apple ad of all time. The reason is nostalgia — it portrays a kid’s bedroom in the 1980s, and it reminds me of being a kid back then. I also like the details tucked in there, such as the Motley Crue poster, the Bazooka bubble gum, the ATV helmet (next to a tiny photo of a three-wheeled ATV), the hamster, and an Apple Modem 300/1200 sitting under the telephone. I also wonder what those circuit boards up on the shelf are supposed to be (and what they were actually from). 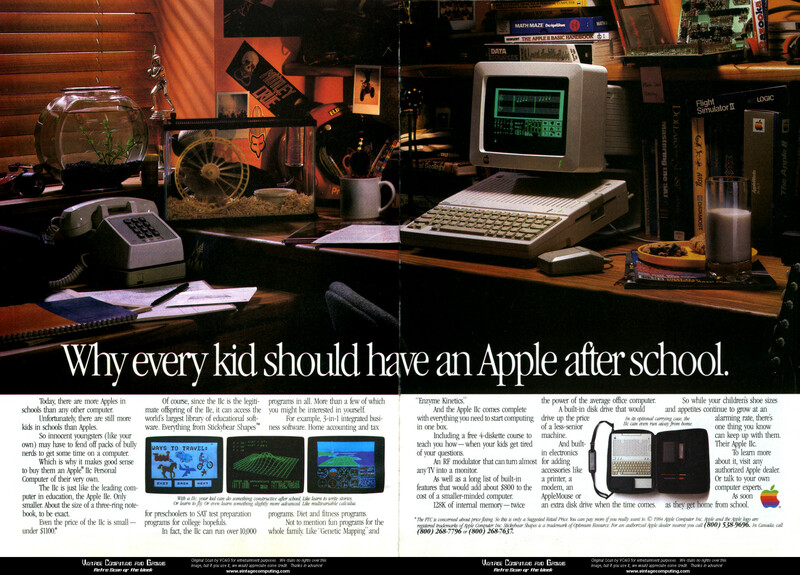 The Apple IIc was indeed a great machine for young students in the 1980s. 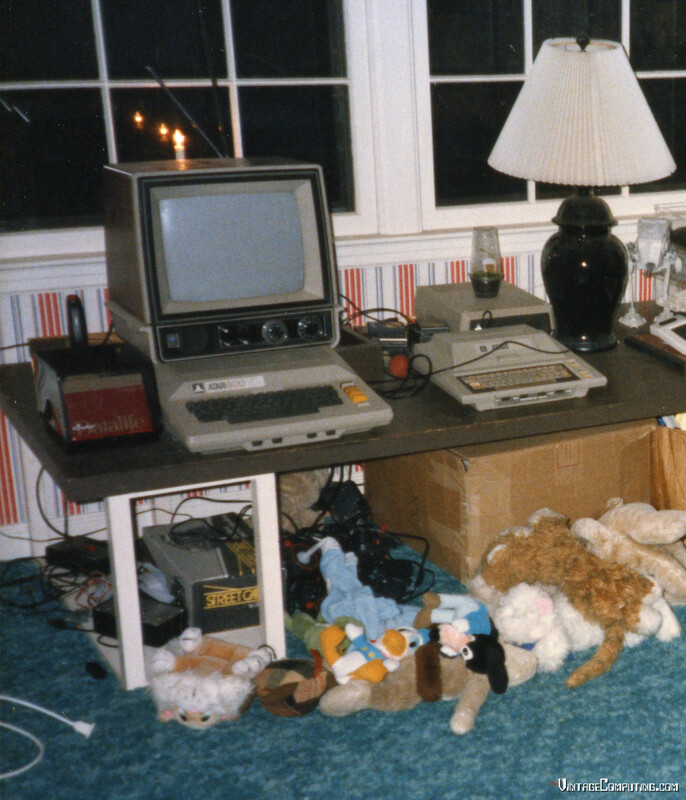 At 37, my circa-1985 bedroom was outfitted mostly with He-Man figures and stuffed animals, but my older brother’s bedroom looked more like the room in the ad. 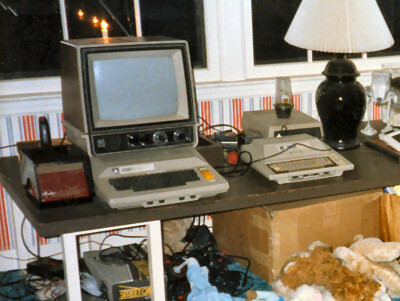 You’ll notice the nice Atari 800 setup, which I have no doubt talked about many times before. 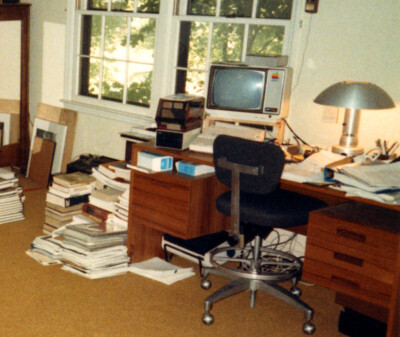 At that time, we did have an Apple IIc as well, but my dad kept it in his home office. It was the first computer I ever used a mouse with. 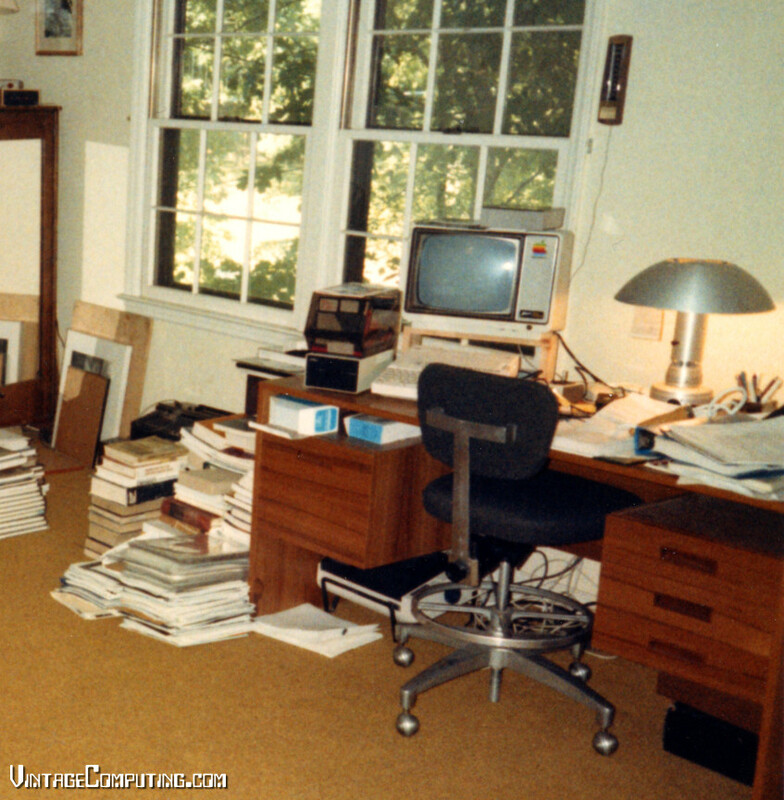 You’ll notice the Star brand dot matrix printer on the floor beneath the desk. I still have many vivid memories of crawling around the floor and watching Print Shop banners and calendars emerge with an intense and persistent screech. In 2016, I did a whole slideshow about my family’s computers through the years for PCMag. If you enjoyed these family computer snapshots of mine, you’ll enjoy that as well. Discussion Topic: Did you have a computer in your bedroom as a kid? Tell us about it. My family has this way of saving everything. Not through conscious, organized preservation, but by virtue of never throwing anything away. In that vein, I was digging through some old papers at my mom’s house after my father passed away in 2013, and I came across this homemade Halloween greeting card. From the looks of it, my dad made the card for me and my brother using Broderbund’s Print Shop on the family’s Apple IIc. It is printed on a single sheet of 8.5″ x 11″ paper; one is supposed to fold it in half twice to achieve a gatefold design with a front, inside, and back. Click the image above to see the whole thing unfolded — the other side is blank. As for who colored it with crayons, I’m guessing I did (perhaps my dad or brother did it neatly, then I gave it a once-over with a brown squiggly line). What a great momento from the home PC era. Happy Halloween! Discussion Topic of the Week: Have you ever made a personalized greeting card using your computer? Tell us about it.